As much as things change around us, our seven amazing California State Parks at Lake Tahoe and Donner are a constant, along with the knowledge that Sierra State Parks Foundation supports them. Thanks to our donors, volunteers and members, SSPF has achieved significant milestones for our parks: an SSPF sponsored state park interpreter at Lake Tahoe provides year-round educational programming; the state park volunteer program at Donner Memorial thrives and grows; numerous restoration projects are complete while many others are underway; and almost 30,000 visitors learned about local history on tours operated by SSPF at Vikingsholm and the Hellman-Ehrman Estate. Ensuring this momentum continues means taking the next step. The biggest concern for stewards of our parklands is not necessarily the challenge of inadequate budgets and maintenance backlogs. Our parks have a diversity problem of age and color. We need diversity among park users to ensure adequate future funding, volunteers and advocacy. Only by making these special places relevant and vital to the next generations, as well as people of color, will they learn to care for and support parks. Attracting advocates and users of our parklands is required for a solid future of our state park gems. SSPF’s board members have been pondering this dilemma and considering ways to make our parks more welcoming. To that end, we are embracing two solutions to remove barriers to visiting and enjoying the parks. The first is the development of a Lake Tahoe-Donner State Park app. Taking advantage of recent state parks infrastructure improvements to provide public internet service at the Sierra State Parks, SSPF is raising funds for the development of a mobile application which will guide visitors to trails, park programming, tree identification and much more. This free app will be developed on both Android and Apple platforms. Studies show today’s millennials are more separated from the natural environment than any other generation before them. We want to take full advantage of the interests of the “selfie generation” to better engage them as park users. The use indicators of this platform at other parks around the country demonstrate that apps are a popular idea, embraced by young people. The second solution is our plan to sponsor disadvantaged families to visit our parks. A modest $25 donation will sponsor two families to enjoy a day in the state parks we support. Working with the local schools and other resources, we will issue parking vouchers and welcome packets for use this coming summer — hopefully removing a barrier to park attendance and engaging a new generation of park supporters. We want the face of our park users to reflect the diverse face of California. Won’t you help us by donating a sponsorship? Let’s be forward thinking and clear the way for positive change. Together, we can. Heidi Doyle is executive director of the Sierra State Parks Foundation. 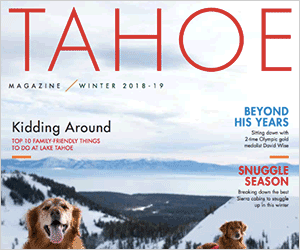 SSPF provides program, volunteer and financial support to the valued cultural and natural resources within in the seven California State Parks in the Lake Tahoe-Truckee Donner region. Visit http://www.SierraStateParks.org to learn more.